Content: Paul’s earlier letter to the Corinthians had not settled all of the problems. It had some good effect upon them but much more remained to be done. In particular, Paul had to settle the problem concerning his own authority. Deep suspicions had been aroused concerning him, for what reasons we do not fully understand. But in great anguish Paul writes to reestablish his own apostolic authority. He also attempts to deal with some more practical matters, like supporting the poor believers elsewhere. 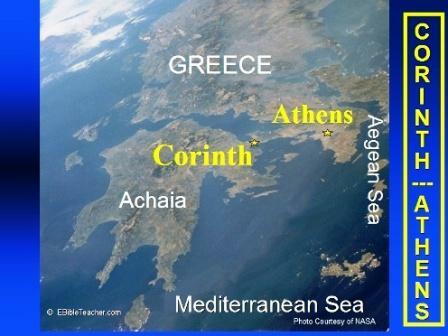 Bible.org's commentary on today's readings in Second Corinthians chapter 1 titled "Why Bad things happen to God's people" is at this link. 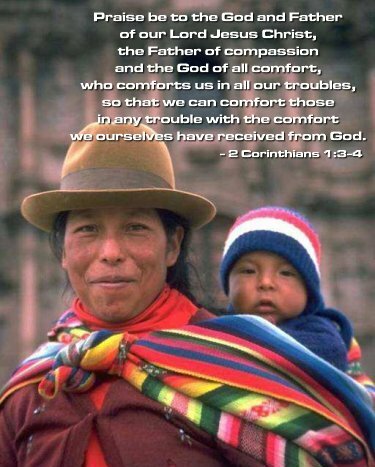 Below is a great image for 2 Corinthians 1:3-4 from today's readings from what looks to be Guatemala to me. (though maybe this picture is more South America/Andes region?) I had the good fortune to travel to Guatemala two years ago - and I miss it! It is a beautiful country with beautiful people! Psalms - Today Psalm 40 verse 16 stood out to me for it's pure joy and praise: "But may all who search for you be filled with joy and gladness. May those who love your salvation repeatedly shout, "The LORD is great!"" Does this verse resonate with you today? Have you searched for God in your life? Are you filled with joy and gladness because of that search? Do you love God's salvation? 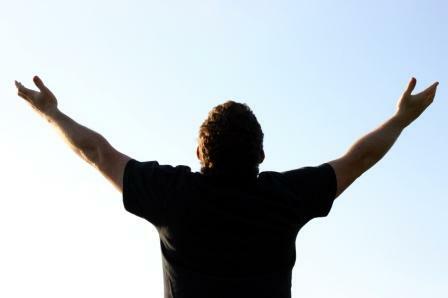 Do you shout praises to God for all he has done for you? Maybe if verse 16 does not resonate for you today, hopefully verse 17 can encourage you: "As for me, I am poor and needy, but the Lord is thinking about me right now. You are my helper and my savior. Do not delay, O my God." Do you believe that Jesus is thinking about you right now? Do you believe that Jesus is your helper and your savior? Has God lit up the sky for you? Click here for Light! Prayer Point: Pray a prayer of praise to God, our Father of compassion and comfort! Pray that you will comfort those in your life who are in any trouble, with the comfort you yourself have received from God through a saving relationship with Jesus Christ. Mike I will attempt to give a brief answer to your question about Job’s perspective on the wicked. The problem with Job’s observation is just that, it is his observation and his own conclusion. Since we look at things with our own eyes, we have our perspective not God’s. People can witness the same accident, and depending on where they are standing, whether their view is obstructed, and throw into this mix, partiality, we will testify on a stack of bibles that what we have seen is true, but each saw things differently. 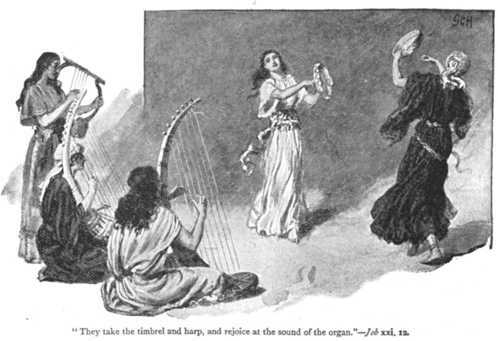 Job is experiencing internally the pain of what happened to him, his three friends are observing from the outside and making their own conclusion of the cause, all four are wrong because none has God’s point of view and none understands that it was not God that brought Job down, albeit, temporarily but it was Satan, though God allowed it. Several things have crossed my mind as I read this, Job’s three “friends” are judging him by what they see and judge themselves by their intentions. That is something we do. They have set themselves “higher” then Job, thus they believe they have the “right” to make judgments against Job by saying he must have sinned because of his state, so they are unable to hear Job’s rebuke of them. They consider themselves wiser than Job because Job is destitute and they are not. There are those who believe their wealth, multiple degrees, etc. make them smarter, wiser and above reproach, so they can give advice, ungodly advice, to everyone they deem beneath them. What I also find in this by all four men are a lot of truth in their speech with a little bit of untruth mixed in. So trying to ascertain which part of their speech is true and/or false, with some assumptions thrown in is kind of like trying to remove the cup of saltwater that has been mixed in with a barrel full of fresh water, impossible. The whole barrel must be emptied and then filled with fresh water again, sans the seawater. Interesting how the trial Job is experiencing is dealt with by Paul. If Paul’s words had been available to Job while he was experiencing this “test”, Job might have had a brighter disposition. However, we today are able to read Paul’s words so we need to stop murmuring and complaining every time something doesn’t go our way. 3 All praise to the God and Father of our Lord Jesus Christ. He is the source of every mercy and the God who comforts us. 4 He comforts us in all our troubles so that we can comfort others. When others are troubled, we will be able to give them the same comfort God has given us. 5 You can be sure that the more we suffer for Christ, the more God will shower us with his comfort through Christ. 6 So when we are weighed down with troubles, it is for your benefit and salvation! For when God comforts us, it is so that we, in turn, can be an encouragement to you. Then you can patiently endure the same things we suffer. 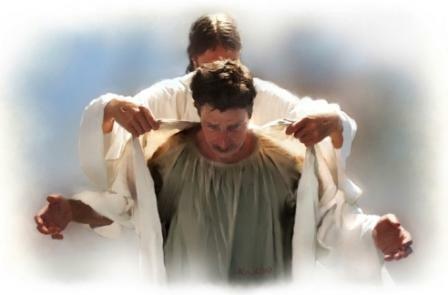 7 We are confident that as you share in suffering, you will also share God's comfort. The 16th verse is the one that caught my attention just like it did to Mike and Vance. be filled with joy and gladness. repeatedly shout, "The LORD is great!" Usually we shout Amen, Hallelujah and the Lord is great when something wonderful happens but even if something bad happens the Lord is Still Great! When a natural disaster comes upon the earth and tens of thousands die, the Lord is Great. When we lose our job, the Lord is Great. God’s greatness doesn’t depend on us having a great day, God is great because He IS Great! Great is part of His Character. 2 The rich and the poor have this in common: The LORD made them both. Another verse in God’s Word that proves no one’s wealth seats them in a higher position or place in life as far as God is concerned. Man is the one who operates in a “class” system. We all want to think we are better than someone else is. Even the poorest of the poor, the lowest on man’s social scale, will observe someone’s behavior and say, “Even I don’t do that,” as if they, me, I, we, set the High Mark for righteousness and social decorum. God have mercy. Job would have to suffer as he was. Reading your comments helps me to see it from a very different perspective. Thank you both for your part in my journey to become closer to God. Each day I look forward to all that is offered on this website. 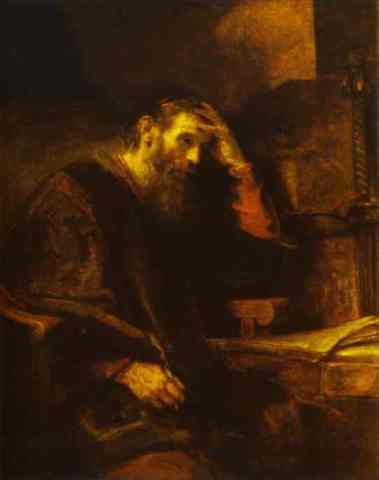 God speaks to me through Rembrandt's painting "The Apostle Paul". Thank you, Mike, for always including such inspiring visual arts to the readings, commentary, and music.